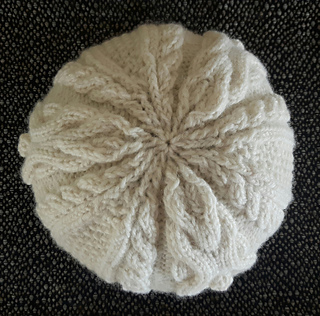 This hat was one of my final two projects for the Master Hand Knitter certification program of The Knitting Guild Association. 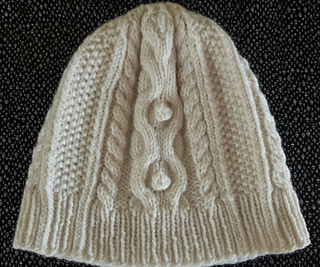 The design includes two cable patterns, bobbles, twisted stitches and background and filler stitches. The length is between that of a beanie and a slouch. 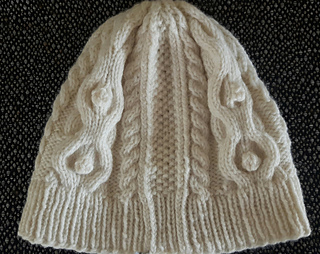 The yarn I used for the hat was Donegal Yarns ORIGINAL ARAN NATURAL YARN (200 g/7 oz; 322 yds/295 m, 100% wool) 1 skein natural light cream white (báinín). It required less than 1 full skein. 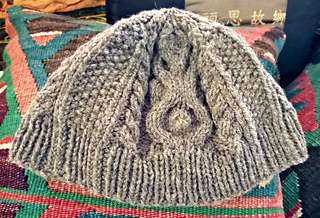 The first photo shows a beanie variation of this hat. To knit the beanie, the only change required in the pattern directions is to work the 16 rows of Chart 1 once instead of twice.